My mother and I had the pleasure of taking a cheesemaking class with Louella Hill last week at Brown University. It was every cheese lover’s dream come true. I’m not sure what I enjoyed more: pulling warm cheese curd into a variety of oddly shaped fresh mozzarella balls, or the opportunity to talk face to face with Louella Hill—someone whom I’ve admired for years. I‘m guessing that Louella is around my age, but she has accomplished more in her life thus far than I could have even dreamed of for my own. In 2004, as a part of her senior thesis at Brown University, she formed what is now Farm Fresh RI, an organization that connects local Rhode Island farms to consumers around the state. They’re largely responsible for the plethora of great new farmers markets that have popped up throughout the state in recent years. That alone could be considered a lifetime’s worth of achievement, but a few years ago Louella set her mind to cheesemaking. She formed Narragansett Creamery, the first artisanal cheese company in Rhode Island. Narragansett Creamery currently crafts ten different cheeses and yogurt. I’m in love with everything they make, but if you remember from my Roasted Root Vegetable Wheatberry Salad, I’m a fanatic for their fresh ricotta. The class was a euphoric experience, and I left with a mountain of invaluable cheesemaking knowledge and a bag full of yummy Narragansett Creamery treats. One of those treats was a block of their Atwell’s Gold, an Italian style cheese that I would describe as a mouthwatering cross between asiago and cheddar. 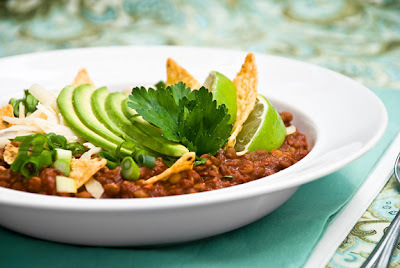 I wanted to create a perfect dish to accompany the Atwell’s Gold and came up with this vegetarian lentil chili which is inspired by some of my favorite bean-based chili recipes. This is a perfect dish to serve to a mixed group of both calorie counters and calorie consumers because each person can decide exactly how decadent they want their serving to be, right at the table. For me, a light sprinkle of cheese, one crumbled tortilla chip, a few avocado cubes, and heavy dose of herbs was perfectly satisfying and kept me content with my total calorie intake for the day. James was able to pile on lots of shredded Atwell’s Gold (one of his favorites) and a big handful of crumbled tortilla chips. Save yourself some trouble and prepare the chili the day before you intend to serve it, as letting the chili rest overnight in the refrigerator only makes it yummier. Thank you Louella for a wonderful cheesemaking experience that I will remember for years to come! Bring a large pot of water to a boil. Add the lentils and cook for 20 minutes. Drain and set aside. Meanwhile, heat the olive oil in a large pot. Add the onion, chipotle pepper paste, salt, chili powder, and cumin, and sauté for 5 minutes over medium heat. Add the bell pepper and sauté until the peppers are tender, about 5 more minutes. Stir in the crushed tomatoes, cooked lentils, cocoa powder, and honey, and bring to a boil. Simmer on low for 10 minutes. Stir in the lime juice. Taste and add more salt if necessary. Allow to rest at least 30 minutes or refrigerate overnight. Chili is even better reheated the next day. Ladle into shallow bowls and serve with the toppings tableside. Yum. Whilst I'm not vegetarian I am adverse to minced meat so this recipe is right up my street. Thanks for sharing. Lentils are a great source of protein for a dish like this! It sounds (and looks) fantastic! Thanks for catching my mistake Lux! The recipe takes 1/4 cup cocoa powder (use a good quality cocoa powder - you wouldn't want it to add any bitterness to chili). I just fixed the post. Looks delicious and as always, love the story. Makes me wish I had some of that cheese to snack on right now! I didn't realize her connection with Farm Fresh RI. Very interesting! This sounds like something we would love, I'll be trying it soon. I like the sound of a lentil chili and it loos great! This is something my family would love! Thank you for sharing this! Hey! I stumbled across your blog via Photograzing @ Serious Eats and I had to try this chili. I just finished making (and eating) it and I foresee it becoming a staple :) Thanks and please keep it up!